(Rick Bowmer | AP Photo) In this June 26, 2017, file photo, Doug Rice, right, and his daughter Ashley, left, look on with other patients, caregivers and supporters during the Utah Patients Coalition news conference at the Utah State Capitol, in Salt Lake City. Medical marijuana backers are moving forward with a ballot initiative to ask Utah voters directly to pass a broad medical marijuana law next year. The Utah Patients Coalition got state approval Thursday, Aug. 10, 2017, to start collecting the 113,143 voter signatures for the ballot initiative in November 2018. 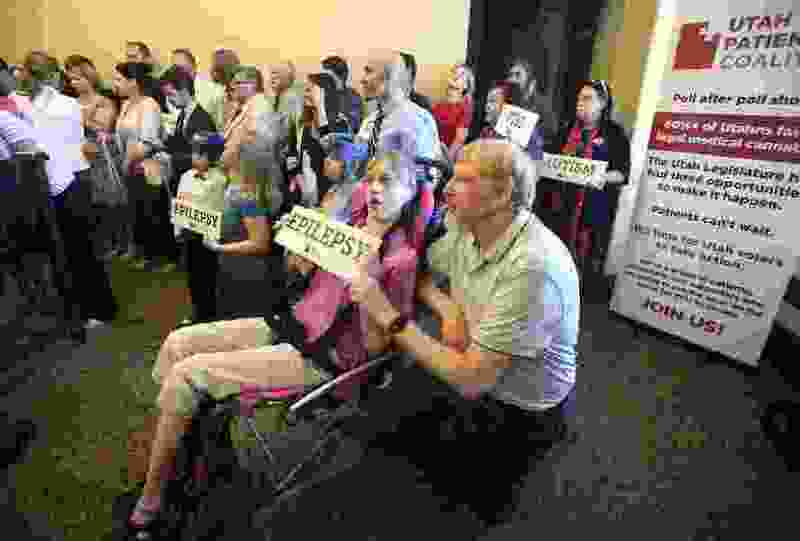 Doug Rice, right, and his daughter Ashley, left, look on with other patients, caregivers and supporters during the Utah Patients Coalition news conference at the Utah State Capitol Monday, June 26, 2017, in Salt Lake City. A group of activists and Utah residents with chronic conditions has launched a ballot initiative to ask voters next year to pass a broad medical marijuana law. Utah voters will become legislators in the Nov. 6 general election — deciding whether to allow medical marijuana, expand Medicaid, cement recent changes in how candidates qualify for the ballot, and try to stop gerrymandering. Supporters of four initiatives on those issues say they each gathered at least the 113,143 signatures needed to qualify for the ballot — and from 26 of the state’s 29 Senate districts as required — as the deadline to submit them hit Monday. Signatures must still be verified in coming weeks by county clerks. The magic number of 113,143 is equal to 10 percent of the votes cast statewide in the past presidential election. Meeting the tough signature-gathering requirement will give voters the chance to weigh in on issues that polls have shown are supported by a majority of Utahns, but consistently failed to gain traction in the Legislature. One initiative fell short: the “Keep My Voice” effort by conservative Republicans. It aimed to return to the caucus-convention system as the only path to the ballot for candidates, no longer allowing them to qualify by gathering signatures. Organizers conceded they did not gather enough signatures — but aim to try again in 2020. A legislative compromise avoided yet another initiative — the Our Schools Now effort that had proposed to raise taxes for schools by $715 million a year. Instead, the Legislature approved a deal that could raise about $375 million a year for schools after five years — if voters approve a 10-cent gasoline tax increase that lawmakers agreed to put on the ballot this fall, so voters will still have a direct voice on that issue. The proposed gas tax hike could allow shifting to schools some sales tax revenue that now goes instead to transportation, among other tax increases. If OK’d in the election, the increase still would have to be enacted by the Legislature because the ballot measure is a nonbinding advisory vote. Austin Cox, campaign manager for Our Schools Now, said the group had gathered 150,000 signatures — more than the minimum needed — for the school tax boost. But with the compromise, he said it submitted a letter Monday to Lt. Gov. Spencer Cox formally withdrawing efforts to appear on the ballot. (Rick Egan | The Salt Lake Tribune) Gov. Gary Herbert talks about his recent trip to Washington, Thursday, March 1, 2018. Rep. Becky Edwards, R-North Salt Lake, who sponsored the compromise, said it came only because so many people had signed the Our Schools Now petition. “Signing the initiative was a great way to make their voices heard,” she said. DJ Schanz, director of the Utah Patients Coalition, estimated that his group gathered nearly 200,000 signatures to put legalizing medical marijuana on the ballot. “The numbers of signatures and the support we see across the state make us very optimistic about our chances” this fall, Schanz said. A Dan Jones & Associates poll in January for The Salt Lake Tribune and the University of Utah’s Hinckley Institute of Politics found that 76 percent of Utahns strongly or somewhat support the proposed initiative. Since then, the Utah Medical Association opposed the initiative and The Church of Jesus Christ of Latter-day Saints praised the UMA’s stance without quite directly opposing the initiative itself. Herbert also has come out against the initiative. The Legislature sought to offer a compromise to stop the initiative. It passed laws allowing terminally ill patients to try medical marijuana and for the state to arrange growing it for them. Supporters said that is far too little to satisfy them, and leaves out many people whose pain and suffering could be eased by using cannabis. Disclosure forms show that 72 percent of the $267,000 raised by the Utah Patients Coalition this year came from out-of-state donors, and 44 percent — or $118,000 — came from the Marijuana Policy Project based in Washington, D.C.
Schanz said that nonprofit “also cares about the sick” who would benefit from medical marijuana and has supported similar efforts nationwide. He said the majority of the Utah Patients Coalition donors — if not the majority of money raised — came from Utah. The Utah Decides Healthcare initiative collected more than 165,000 signatures, said its director, RyLee Curtis. Supporters say it could fully expand Medicaid to cover 150,000 more low-income Utahns. The Legislature passed a weaker version hoping to stop the initiative, which would cover about 72,000 residents now going without insurance. Lawmakers say their version wouldn’t increase state spending. A poll for The Tribune and Hinckley Institute in January showed that 62 percent of Utah voters either strongly or somewhat support the initiative. The group reported spending nearly $1.6 million to gather signatures this year. It reported raising just over $2 million — and 99 percent of it came from The Fairness Project of Wasington, D.C., which has also supported initiatives nationwide for such things as raising minimum wages or increasing sick leave. 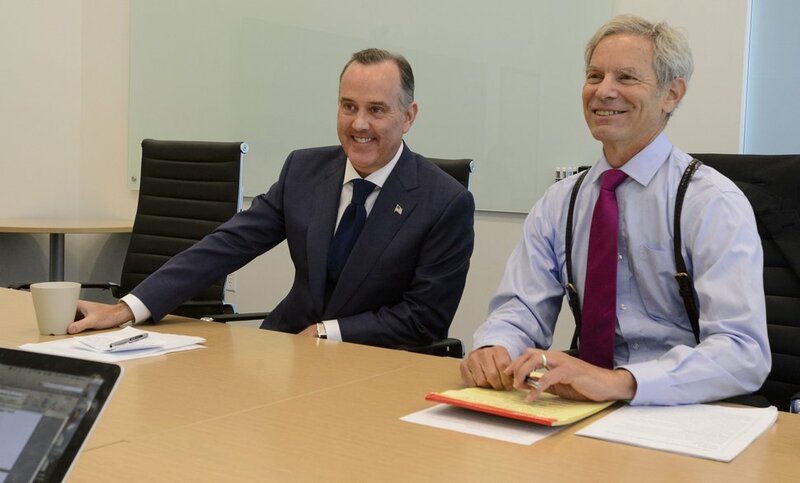 “It has been a real blessing for us to have that help for real Utahns who are struggling without health care,” Curtis said about financial support from that group. That initiative seeks to cement a 2014 election law, called SB54, that allows candidates to qualify for a primary election either through the traditional caucus-convention system or by gathering enough signatures. It would also lower the number of signatures needed to qualify through that route. The group is pushing the initiative after the Utah Republican Party has continued to to try to overturn SB54 through lawsuits and legislation, and seeks to return just to the caucus-convention system. Count My Vote says the initiative allows all voters to settle the matter. Conservatives dominate GOP conventions and tend to pick nominees far to the right of the political mainstream, according to Count My Vote. The group says voters have more choice and chose politicians who are more representative when candidates may also qualify by gathering signatures. They point to how the Utah Republican Convention last year nominated ultraconservative Chris Herrod in a special congressional election and rejected more moderate Provo Mayor John Curtis. But Curtis had qualified anyway by gathering signatures — and easily won the primary and general elections. 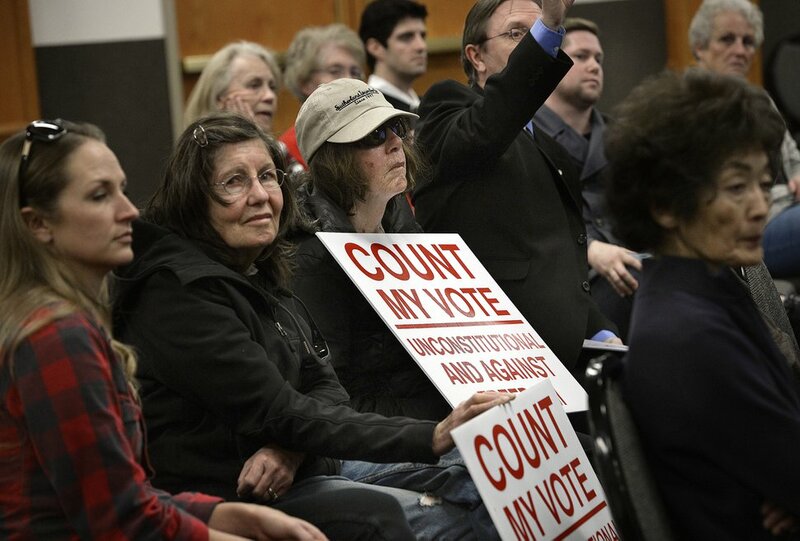 Count My Vote reported raising nearly all of the $1.7 million total it raised from Utahns. That included some big individual donations of $100,000 or more each from Zions Bank President Scott Anderson, developer Kem Gardner, Utah Jazz owner Miller and developer and Real Salt Lake soccer team owner Dell Loy Hansen. A Tribune/Hinckley poll in January found that voters support a dual path to the ballot by a 2-to-1 margin. The Better Boundaries Coalition — seeking to turn over the redrawing of Utah’s political boundaries to an independent redistricting commission — said it collected an estimated 190,000 signatures. “Utahns are speaking loud and clear — the people should choose their politicians, politicians shouldn’t choose their voters,” said co-chairman Jeff Wright, a Republican and former congressional candidate. He said so many signatures show “that an independent redistricting commission is an idea Utah is ready for.” Former Salt Lake City Mayor Ralph Becker, a Democrat, is the other co-chairman. Redrawing boundaries for Congress, the Legislature and state school board is now handled by the Legislature, which has led to charges of gerrymandering for political gain. For example after the 2010 Census, then-Democratic U.S. Rep. Jim Matheson accused legislators of splitting up his old district four ways and making re-election impossible in the district where he lived — so he ran in an adjacent district that included more sections of his old district. With the unusual move, Matheson barely won re-election — by 768 votes — over GOP challenger Mia Love in 2012. Two years later, he opted not to seek re-election, and Love won the seat. A Tribune/Hinckley poll in January showed that 51 percent of Utahns favor the initiative — but a large 25 percent were undecided. Utahns for Responsible Government, the political issues committee that raises money for Better Boundaries, raised 70 percent of its $706,000 in donations this year from out of state. That included $355,000 from the Action Now Initiative based in Houston and $100,000 from the Campaign for Democracy based in Los Angeles. Correction: April 16, 8:55 p.m. • An earlier version of this story misstated a federal program that may be expanded in Utah by voter initiative in November. That program is Medicaid.